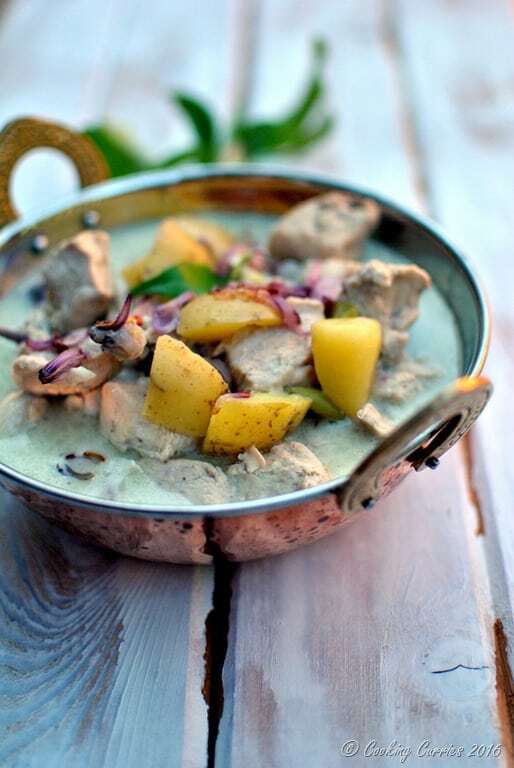 Simple, yet flavorful Kerala Style Chicken Stew with Coconut Milk will be your new favorite Chicken Curry soon! 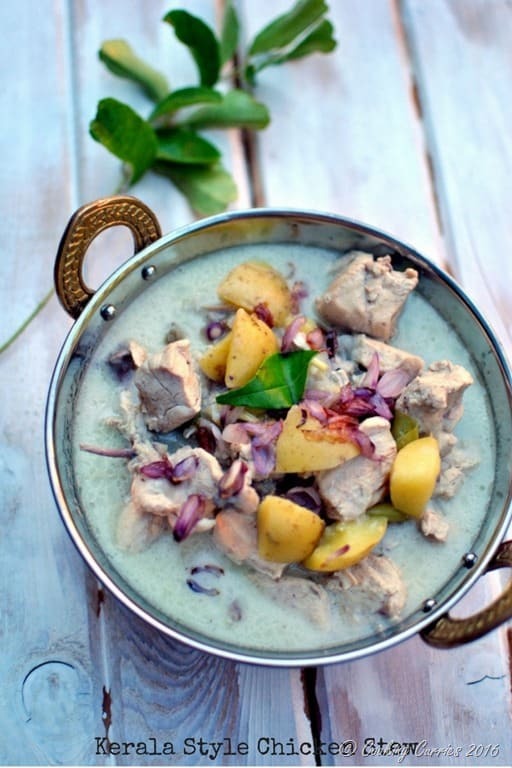 Whenever I think of stew, the first thing that comes to my mind is lightly spiced coconut milk – very simple, just a hint of aroma of spices, flavor of coconut milk and of course potatoes. That is what every stew should have. You can make it a vegetable stew by adding some carrots, beans, peas etc or a chicken stew by adding some chicken to this. 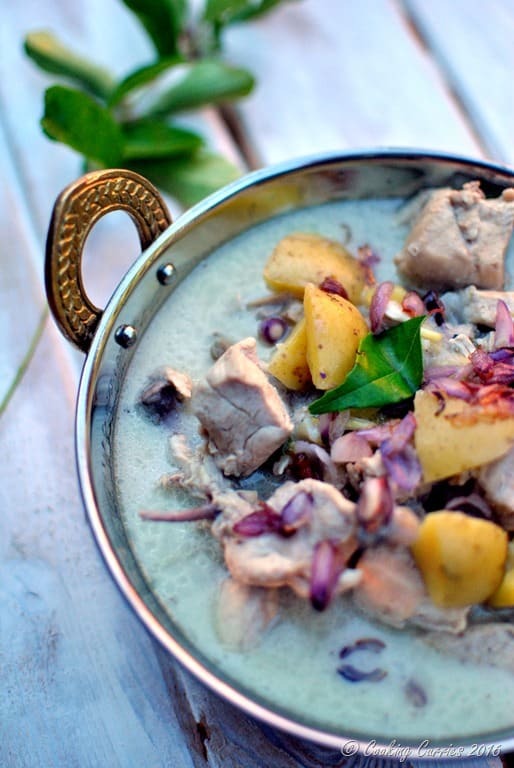 Stew – vegetable or chicken is an integral part of Kerala cuisine and it mostly features in the breakfast menu. Typical combinations would be appam ( thin lacey pancakes) with stew or white bread with stew or idiyappam (string hoppers / steamed rice noodles) with stew or even idli (steamed rice and lentil cakes/dumplings) with stew . But then again you can always make this as a side for chapatis, parathas etc. Heat the oil in a large pot and add the onions, green chillies, ginger and garlic to it. Sauté till onions almost turn translucent. 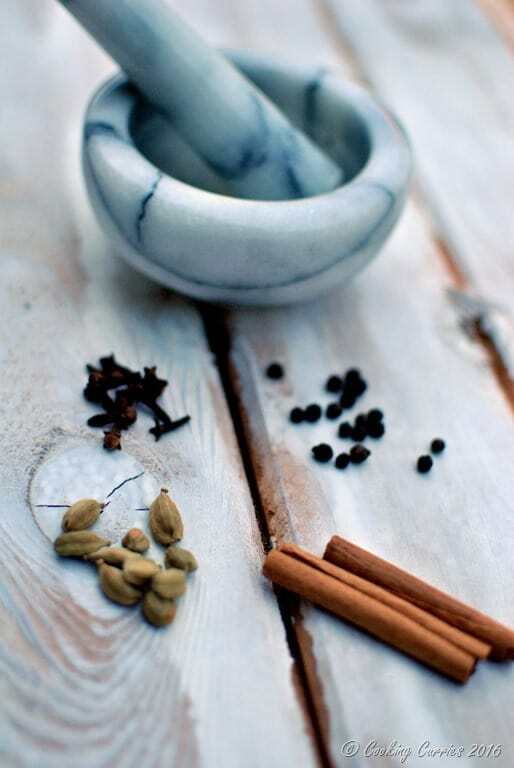 Meanwhile, crush the spices a little in a mortar and pestle. Add these crushed spices to the onions. Add the chicken pieces to the pot as well. Stir well. Once the chicken starts to change color on the outside, add the potatoes and add maybe 1/2 cup of water to the pot. Cover and cook till chicken and potatoes are almost done. There will be water coming from the chicken, so the 1/2 cup water should suffice. Also, we don’t want too much water as we are going to add the coconut milk later. 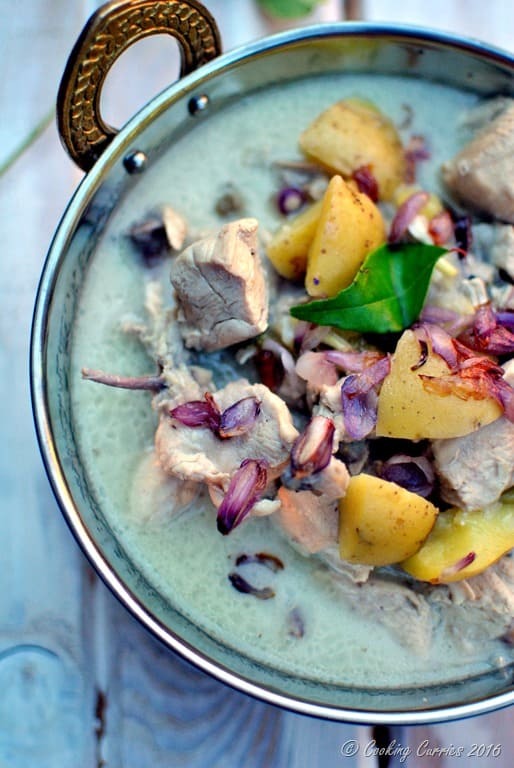 Once the chicken and potatoes are almost cooked, add the coconut milk to the pot and let it cook the chicken and potatoes a little more. Add the salt to the pot as well. Let simmer for 10 mins or so. Heat the oil for seasoning in a separate small pan and add the sliced pearl onions and curry leaves to it. Once the onions turn brown, pour this onto the stew. Serve with any of the combination mentioned earlier in the post.